MSRDC finalises plans. Work to start after LS polls. Experts say road is too narrow to handle 45,000 vehicles that Sea Link will bring every day. The Maharashtra State Road Development Corporation (MSRDC) has finalised its design for Bandra-Versova Sea Link connector that will land at Carter Road, raising concern that the largely residential area will be flooded with traffic. According to MSRDC’s own estimate, over 45,000 vehicles will use the connector every day. After Worli Sea Face, a part of which has been taken over by the BMC for the construction of coastal road, Carter Road is the second seafacing promenade that will lose its identity and charm to a project aimed at easing the strain on Mumbai’s existing road network. The Bandra-Versova Sea Link will bring the travel time between the two suburbs down to 10 minutes from the existing 90 minutes. Residents, however, believe that this advantage will be lost once motorists exit the Sea Link and enter the narrow roads in Bandra and Versova. The connector will land on Carter Road outside Otter’s Club, which residents fear will turn the entire sea-facing road into a traffic bottleneck. “Carter Road is very narrow. There are traffic jams with the existing levels of traffic. Just imagine the situation when 45,000 more vehicle start landing here every day,” said Congress corporator Asif Zakaria, who, along with other residents, has filed his objections with the MSRDC. The MSRDC, however, claims it has not received a single complaint and is likely to commence work on the Sea Link soon after the Lok Sabha elections. Officials said all permissions are in place, including the Bombay High Court’s gohead for cutting 2.99 hectares of mangroves. MSRDC’s chief engineer and project in-charge Shankar Dhote said: “We have not received any representation from residents regarding change of landing point nor have we received any traffic study from BMC suggesting alternative landings. So, we are going ahead with our work,” he said. The Sea Link will have three connectors – one each at Bandra Reclamation, Carter Road, and Juhu Koliwada. On the south it will link with the Bandra-Worli Sea Link and its northern end will land at Versova’s Nana Nani Park with a road link to SV Road in Andheri. Vikram Rao, president, Otter’s Club, expressed surprise over MSRDC’s claim that it has not received any objections from residents. He said he was part of a group that met MSRDC officials in January this year and submitted that just one connector at Carter Road would not be enough for quick dispersal of traffic. “We had asked MSRDC to make the traffic study report public. We also suggested that an additional connector at Khar Danda be built. But we haven’t heard from them yet,” Rao said. The Versova-Bandra Sea Link is a crucial component of the coastal road project — a plan to connect south Mumbai and the western suburbs through a series of roads on land reclaimed from the sea, tunnels and sea links. It is taking shape nine years after the 5.6 km Bandra Worli Sea Link was opened to motorists. 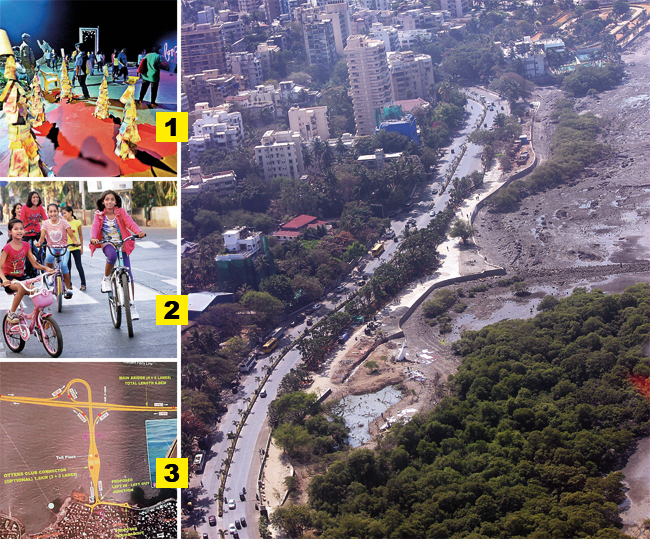 It will have a 300-metre cable-stayed section similar to the one on the Bandra-Worli stretch. Shyama Kulkarni, a Bandra activist and an AGNI trustee, said Carter Road is not just a road. “It is a social space. We have an amphitheater and street plays and other cultural events take place on the promenade. All this will be drowned under a sea of acars once the Sea Link connector opens,” she said. The promenade was an illegal dumping ground before it was developed into a swanky community space 18 years ago. BJP legislator Ashish Shelar said he stands in unity with the residents on the issue. “We already have had one round of meetings with the MSRDC officials on this issue. After Lok Sabha elections, we will have another round of talks,” Shelar said.